I forgot to mention a few climate idiosyncrasies we have noticed since we arrived in NZ. The first thing that you notice is the quality of the light. Although it is your typical sunny day, the light seems to be somehow brighter. I am not sure whether this has anything to do with the second interesting thing, the fact that NZ seems to be directly underneath a big hole in the Ozone. Yes that’s right, although the causes may be in dispute as to why the Ozone layer is depleting, the fact that there isn’t much of it above NZ is largely accepted by all. When you turn on the TV you notice lots of ads about UV protection and learn very quickly that factor 30 is the minimum that you wear on any given day. The weather forecasts in the Newspapers give the UV levels and over the last few weeks it has been at 11. 11 means stay indoors and plan outdoor activities for the early morning or the late afternoon. This is irrespective of the temperature which has not gotten over 20 degrees much since we have been here. I, the country Paddy, of course ignored all these facts one day as the temperature was about 20 degrees and quite overcast. Nothing that my sallow skin and existing tan couldn’t handle I thought to my peril. Well perhaps peril is too strong a word, but I did get burnt on the old noggin past the comfort stage it has to be said. Needless to say I have been applying the factor 30 to the face and expanding forehead ever since. Probably the most important thing we have discovered is that when the real estate agents boost of North facing living rooms and gardens, it is actually something to be proud of. Logically, although I must admit that it hadn’t occurred to me before we left, the sun path is slightly different this side of the equator! I can take some solace for my stupidity in the fact that many of the first houses built in NZ took advantage of what was thought to be a desirable Southerly aspect also. So I am not alone in my stupidity it would seem. Finally I have studied the water in the sink as it disappears carefully, dying it with toothpaste and the like, and can confirm that the water drains in NZ in a clockwise direction. Unfortunately I forgot to study the way it flows in Ireland but I trust it flows in the opposite direction? Perhaps someone can let me know. Well after our few days in Auckland, we hired a car and made the short trip, by NZ standards, to Hamilton. 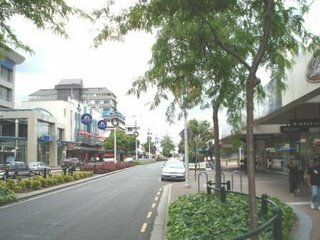 Hamilton is the fifth biggest city in NZ and is inland. 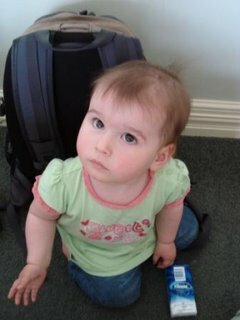 We were planning on staying with Sean McCormack, a brother of Aoife’s, and his wife Anna and little girl Niamh. Being male I have forgotten Niamh’s age but I think it was 14 months? “In Ngarvawahia turn right over a railway line for a road marked, Otorahanga/ Te Kowhai and Whatawhata!” All this in the state of Waikato and The King Country. A mouthful I think you’ll agree. Anyway we found Whatawhata after driving for about an hour and a half. Sean, by the way, being typically Irish had asked that we bring him over some King Crisps. I must say that our days in Hamilton were by far the most relaxing thus far, I could feel the knots disappearing from my shoulders within a few hours and Sharon and I had our first really good sleep. We took out the camcorder while we were there and got some really good, if I do say so myself, videos of Niamh and family. Niamh is adorable and not camera shy either, all the tricks came out. Niamh banging drums, Niamh cycling the bike, Niamh striking a pose……a model in the making I think. 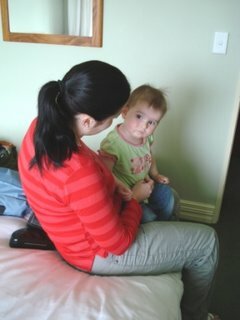 Here’s a photo of Niamh with Sharon for Aunty Aoife. Aoife, we hope to burn the videos onto DVD when we figure out how and send copies to you and Sean. By the way I will let Sean explain the heading on this post to you himself! The first day was spent relaxing at our guests home, drinking some lovely NZ wine and eating fabulous food fresh from the garden. Our first spuds in at least three weeks were “manna” from heaven for a country boy like me. The second day we got up late and headed into Hamilton Town itself. 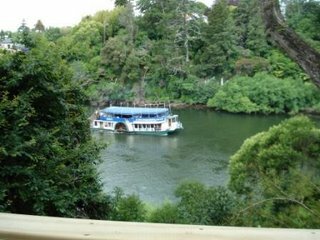 It is bigger than we first thought and it has a fantastic river running through it called the “Waikato River.” The river has a 12km walkway along both its banks and has steam boats that run up and down. 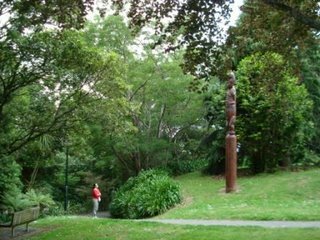 We also came across this Maori statue at one of the entrances. Even though it was the first time we experienced rain since we had arrived it didn’t dampen the spirits. We proceeded from there to eat in a great place called Scott’s Epicurean. The food and atmosphere was great, after which we headed back to Sean & Anna’s. We then bundled into their car and made our way through “Hobbit land” for Raglan. Raglan is a little beach town about 50 km east of Hamilton and the beach is famous for its surfing. Unfortunately the rain had gotten worse over the short trip and we had to go into “Japanese” tourist mode i.e. out of the car, point camera, click camera and back into the car. We took a quick look around the town after the “trip” to the beach and purchased some more Pinot Noir, when in Rome, for the next feed of spuds! We left Hamilton on the Monday and to our hosts credit, the time was all too short and passed all too quickly. Hopefully we will get a chance to catch up again during our stay, either in Wellington or in Hamilton. We might even baby sit!